Add our store to your favorite stores and receive our exclusive emails about new items and special promotions. First Day of Issue Mercanti Signature Mint Engraver Series. First issued in 2006 the Burnished Silver Eagles have quickly become a favorite among savvy U. Coin collectors due to them being the rarest, by mintage, of the three regularly issued Silver Eagle varieties (proof, mint state, burnished)! This particular coin being offered was struck at the West Point Mint in 2018 and has been certified a perfect SP70 First Day of Issue by PCGS!! In addition the label has been hand signed by the 12th U.
Mint Chief Engraver John Mercanti for the exclusive Mint Engraver Series!! 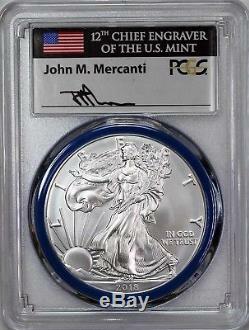 If you collect Silver Eagles, this coin is a must have!! With the combination of first year of issue, a low population and an exclusive pedigree the addition of this coin will make an impact on even the finest Silver Eagle collection! In the event the wrong item is delivered Coin Advisor will pay for the return. 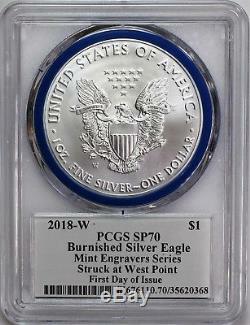 The item "2018 W Burnished Silver Eagle PCGS SP70 First Day Issue Mercanti Mint Engraver" is in sale since Friday, August 3, 2018. This item is in the category "Coins & Paper Money\Bullion\Silver\Coins". The seller is "coinadvisor" and is located in Glendale, Arizona. This item can be shipped to United States, Canada.